The Queen Elizabeth II Conference Centre (QEIICC) is hosting the final stage of the host city selection process for the England 2018 Fifa World Cup bid this week. 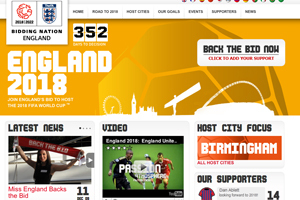 Some 15 English cities are applying for inclusion in England's "Bid Book" as candidates to host matches during the 2018 World Cup. During the final stage of the host city selection process, the 15 cities will give presentations on the suitability of their infrastructure, including stadia, training venues, base camps, fan parks, accommodation and transport. The event will culminate in a press conference at the QEIICC on Wednesday, at which the successful English cities will be announced. England is on deadline to deliver its bid to Fifa by 14 May 2010. There are nine bidders for the 2018 World Cup. Fifa's executive committee will select the 2018 and 2022 Fifa World Cup hosts in December 2012.